Santa Clara County Superior Court clerks headed back to work on Monday, after eight days on the picket line. On Sunday, members of the Superior Court Professional Employees Association voted to approve what had been a tentative agreement reached with court management on Friday. The union seemed to be happy with the new agreement. On Friday, Max Zarzana, Government Attorneys Assoc. president, said getting back to work "would be wonderful for all of our members." On Monday, clerk Shelly Carry said the new raises will be "enough to cover my utilities." Court spokesman Joe Macaluso said: "The court is eager to move forward together and welcomes the returning of employees...and the resuming of our regular operations." 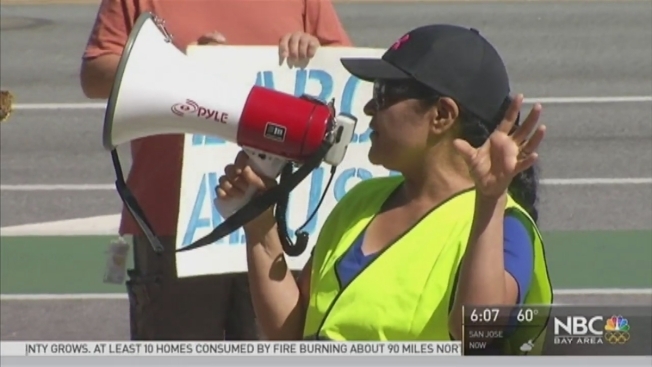 Officials told NBC Bay Area the key issue of a pay raise during the contract's second year has been addressed under the new proposal. Court management had essentially offered a 9.5 percent raise in the first year, but no raise in the second year. The Mercury News reported on Sunday that the court agreed to pay most of the previously negotiated raises immediately, with the rest by November -- four months earlier than originally proposed. That effectively puts an extra half-percent raise in workers' pockets. Second, the court will give workers another 2.5 percent bump in the second year if, a statewide cost-of-living increase is approved. As a fallback plan, the Mercury News reported, the court would have to match any increase given to its other employee unions, under a "me too" clause. Plus, the court agreed to shorten the union's contract from two years to 18 months, allowing workers to go back to the table sooner.